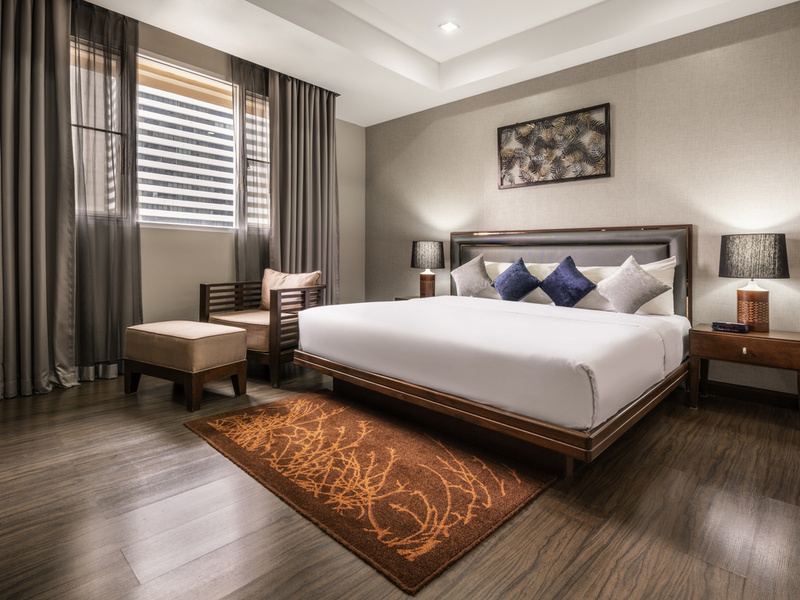 Located near Asoke BTS Station, Makkasan Station and the MRT/Railway link, this hotel enjoys easy connectivity to all the public transits and there is a shopping mall just around the corner. The hotel offers apartments with large rooms, two bathrooms, a huge TV, good Wifi and a well-appointed kitchen to make you feel home. The staff was super-friendly and the security guard assured complete safety of the all travelers. 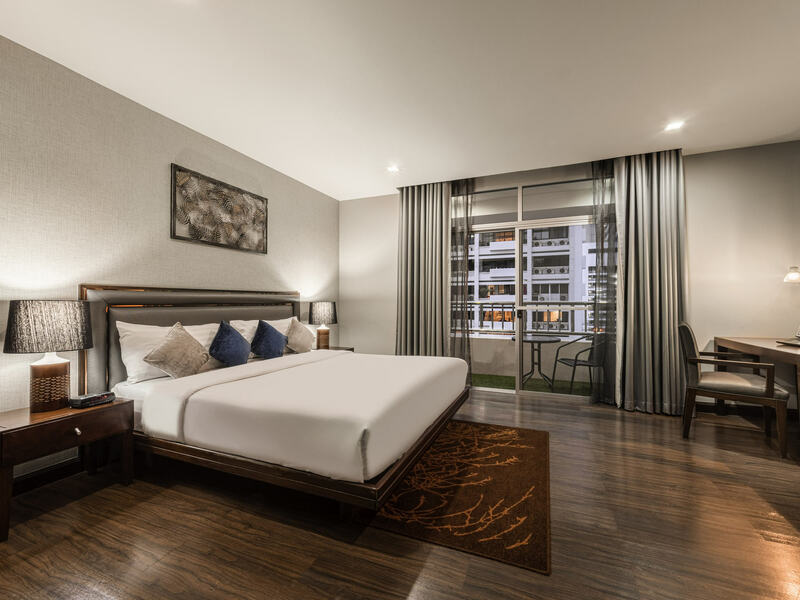 Hotel Grand Mercure Asoke Residence, Bangkok is one of the most sought-after 5-star hotels in Bangkok providing guests with an unparalleled holiday experience. The hotel is an ideal stay for couples on their honeymoon as well as for family holidays. The hotel offers its guests a variety of luxury amenities such as a spectacular rooftop swimming pool and a relaxing sauna. The hotel is located at a close proximity to the Asoke BTS station and Sukhumvit Road. 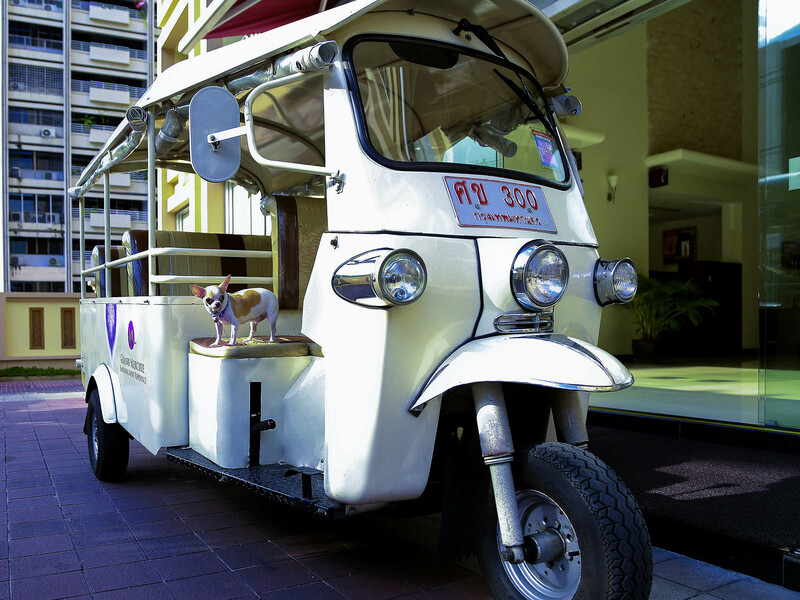 The hotel provides shuttle services for the convenience of guests to a number of nearby spots. For the shopaholics, the shuttle also goes to Terminal 21 shopping mall. 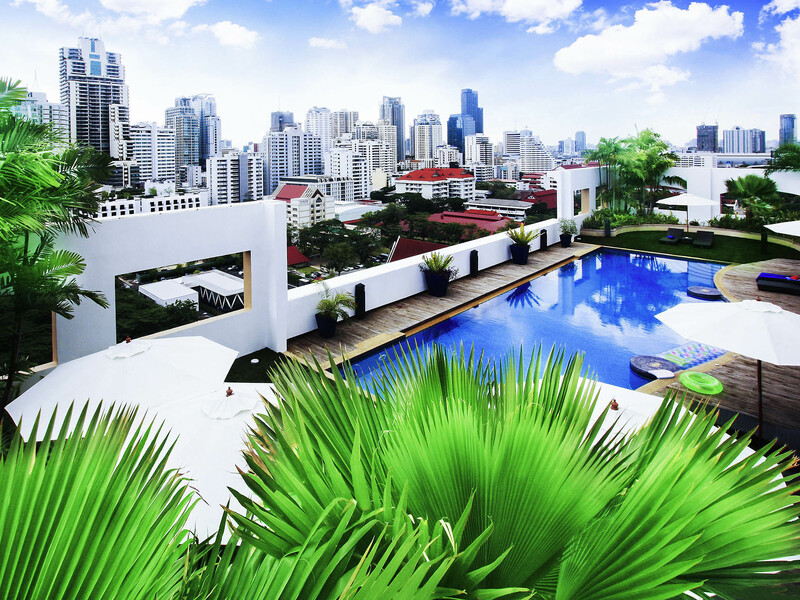 For travelers that would love to explore the glistening nightlife of Bangkok, this hotel is the perfect place to stay at. Its luxury rooms and modern amenities are sure to relax guests after a full day of sightseeing. 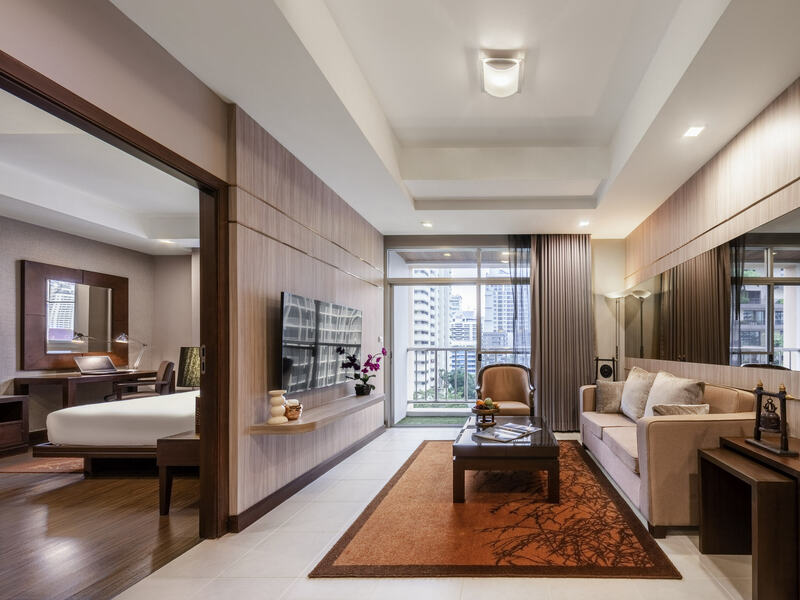 The rooms are quite spacious and luxurious at Grand Mercure Asoke Residence, Bangkok. Apart from this, they are well maintained by exceptional housekeeping services. Guests will experience a quiet and comfortable stay in their rooms which includes a separate living area, bedroom, kitchen, and restroom. In total, there are 76 rooms with 32 non-smoking rooms. Guests can choose from a Superior Suite, Deluxe Suite, Executive Suite based on their space requirements and budget. All rooms have a kitchenette and private balcony attached for the convenience of guests. 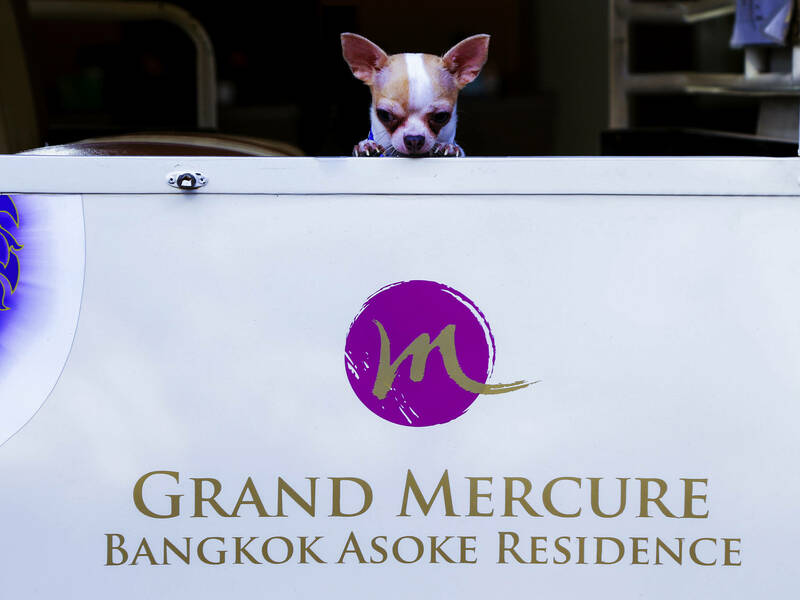 The Grand Mercure Asoke Residence, Bangkok goes all the way when it comes to enhancing the holiday experience of its guests. 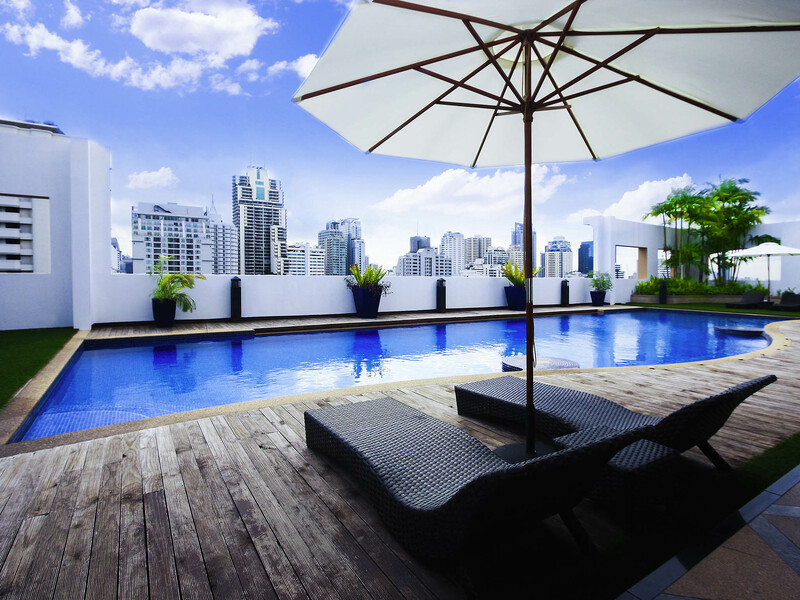 The hotel features a rooftop swimming pool where guests can unwind and relax while enjoying the beautiful city views. The rooms at the hotel feature private balconies and are equipped with all modern day amenities. There is also a fully-equipped kitchen sufficient for two people, a safe to keep important belongings, laundry service and TV. Upon request, babysitting facility is also available so parents can go ahead and enjoy the bustling nightlife of Bangkok. The Grand Mercure Asoke Residence, Bangkok features a snack bar where guests can enjoy light meals and beverages. While the hotel does not house a restaurant of its own, one does not need to worry about dining at all. The hotel is surrounded by a large number of restaurants offering a variety of cuisines and delicacies from all over the world. Le Dalat is a restaurant that offers scrumptious Vietnamese food, Taye offers a unique Ethiopian cuisine, JP and Avra serve French and Greek food respectively, SFizio for those who want some Italian food. With so many options around, guests will never fall short of exploring a new cuisine every day. 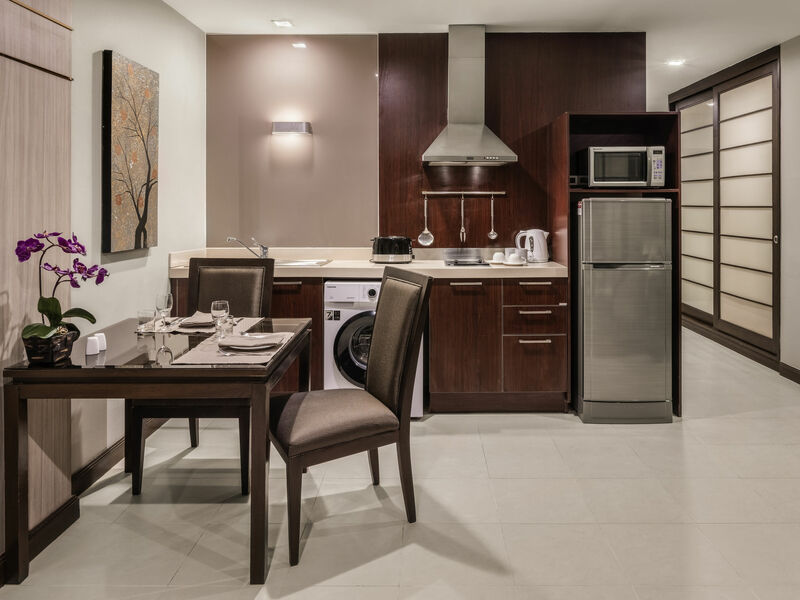 The hotel features a kitchen where guests can go ahead and try their hand at cooking their favorite meals. 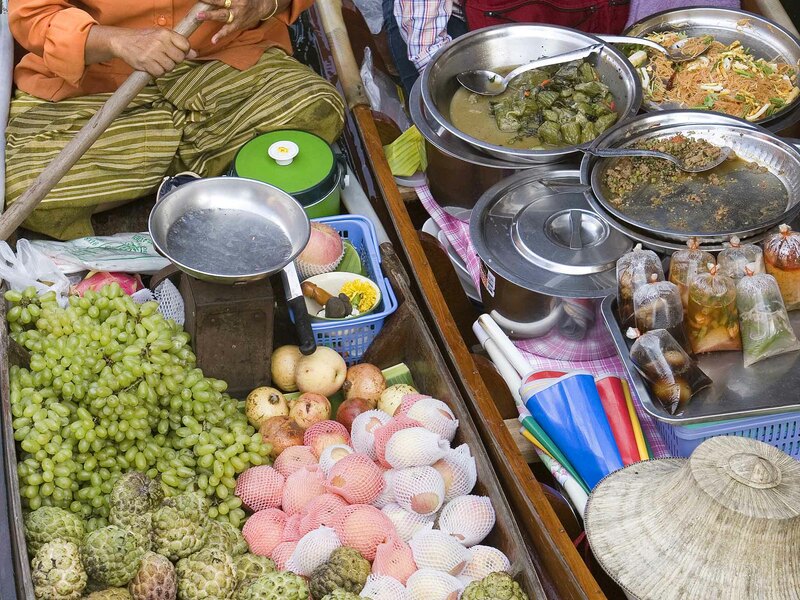 They can also buy groceries from the local Tuesday and Thursday market or from 7 eleven which is 200m away. Guests are sure to have a satisfying experience at the hotel. They can choose to relax at the hotel with an exotic Thai massage or they may explore the riverside, go around the city for some shopping and spend some fun-filled leisure time. The hotel experience till the check-out time is hassle-free and pleasant. The hotel is about 20.4kms from Don Mueang International Airport. No, the hotel does not have pickup service from the airport, but it does provide shuttle services to all major locations nearby. 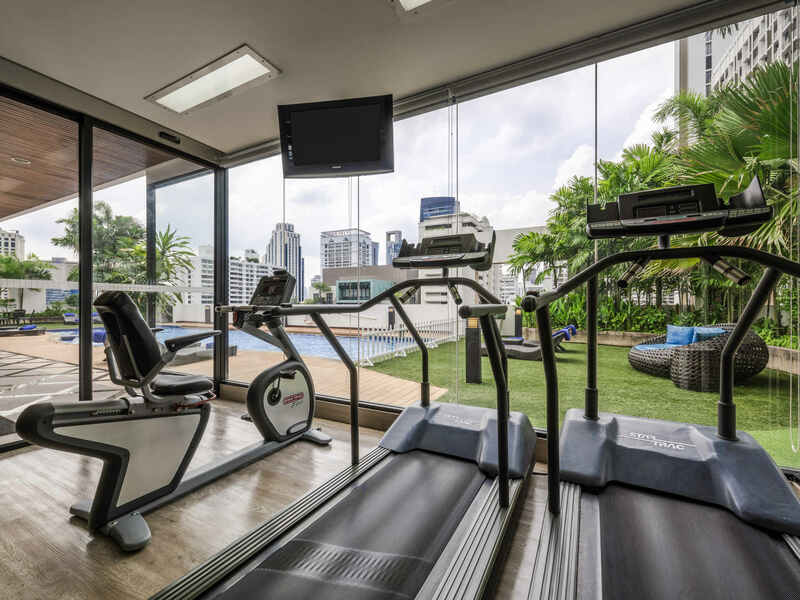 Hotel Grand Mercure Asoke Residence, Thailand offers a range of activities from golf, to swimming, fitness, and spa. There is also Terminal 21, which offers great shopping and dining experience to the guests. 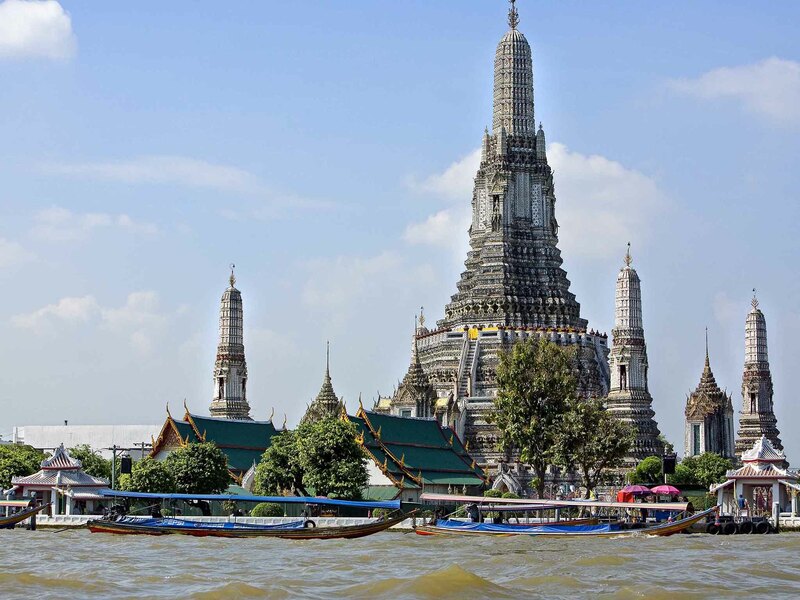 The river Chao Phraya and Benjakiti Park are great places for the nature lovers. Breakfast at the hotel is not complementary and include additional payments. There are offers for business booking where an organisation may want to book 7 or more rooms at the hotel. 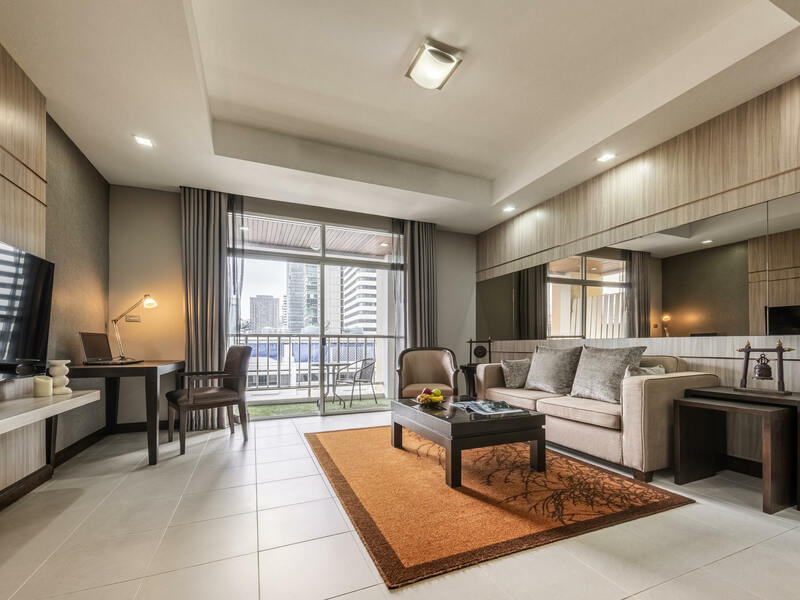 Hotel Grand Mercure Bangkok Asoke Residence is a grand and spectacular 5-star hotel that is suitable for a family vacation as well as a business trip. The rooms are spacious and offer luxury services like TV, air conditioner, a kitchenette, separate dining area and so on. The rooms are also soundproof and have a private balcony. The rooftop swimming pool adds to the already magnificent experience and boasts of breathtaking views of the city. Located at the center of the city, access to all important attractions is very easy and with free shuttle service to all major stations, there is no need to worry about local travel. 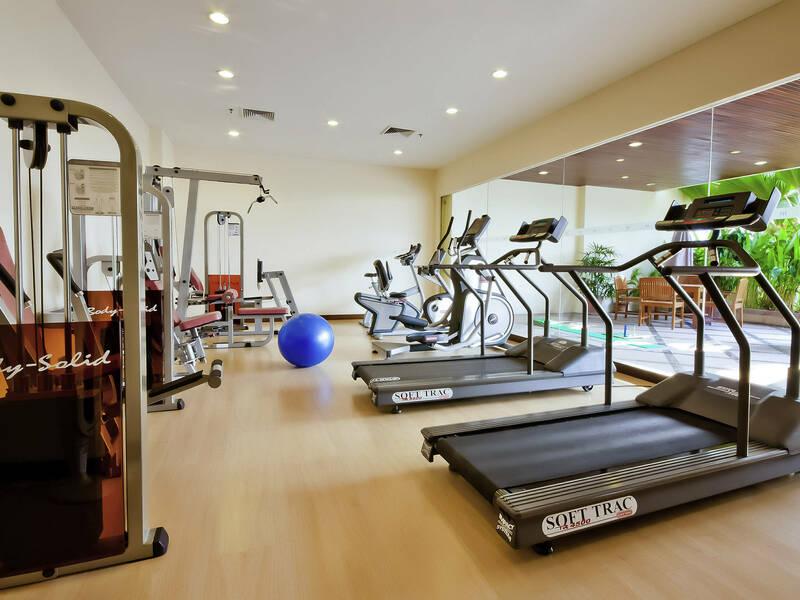 Whether on a holiday or business trip, guests can relax and rejuvenate themselves at the spa, break away from stress at the well-maintained fitness center, cook a nice meal for themselves and watch their favorite shows on TV on the 40-inch screen in their spacious room. The staff is extremely courteous, experienced and friendly, adding to a comfortable and hassle-free stay.